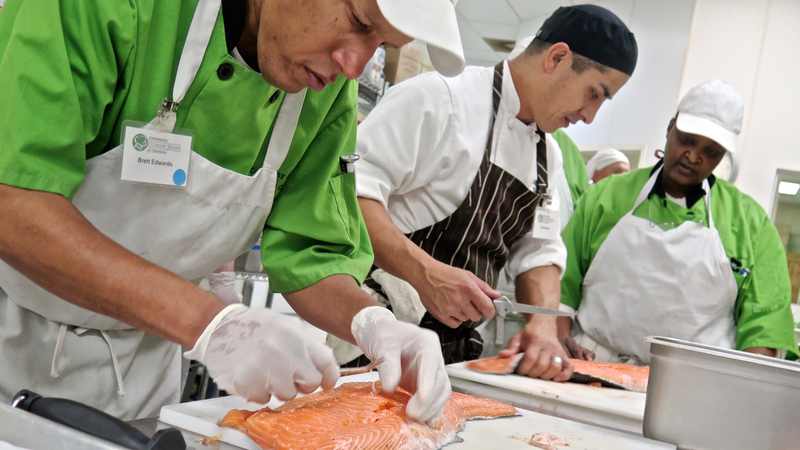 Chef Geoff leads students through steps in preparing fresh salmon for the oven on Nov. 3, 2015. We’re almost there. But we but didn’t quite reach our goal. So The Leon Levine Foundation is extending its CCSC Match opportunity through Dec. 1. Click right here to Donate Now. We are two-thirds of the way to our $15,000 goal, and CCSC still needs your help! Please send your donation today so we can meet this generous challenge. All funds given by New Donors or Donors who did not give in 2014 will be matched $1 for $1. Current Donors: The increased portion of your donation over last year’s amount will be matched $1 for $1. 9315-D Monroe Rd., Charlotte, NC 28270-1427. Thanks to everyone who has already given so generously! And thanks to The Leon Levine Foundation!